A moment may pass, but a memory is forever. There are times in life that we choose to mark with a certain kind of significance, moments where we take the opportunity to commemorate and connect with those around us. 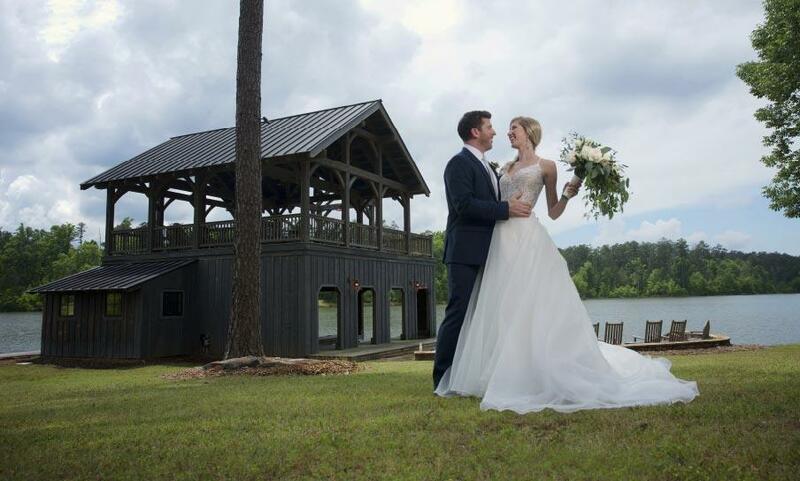 Reynolds Lake Oconee is the ideal location for those in search of a one-of-a-kind place to host their special event. Here, when it comes to saying “I do,” you can do exactly what you’ve always dreamed. For an impressive location that honors your guests and caters to your group’s needs. Take in the fresh air and enjoy meeting new connections on our incredible selection of courses. Your event deserves a breathtaking venue. Our venues provide an enchanting and stunning setting for events of every variety. No matter what the occasion or group, the perfect location awaits at Reynolds Lake Oconee. There are 7 beautiful venues for you. Once a working barn, this marvelously restored structure dates back nearly 200 years. Overlooking a 44-acre stocked lake and two-story boathouse, Sandy Creek Barn at Reynolds Lake Oconee is a magnificent 6,750-square-foot, completely restored wood-beam barn located on 812 acres. With its picturesque qualities — a gabled roof, exposed hardwood, rugged stone accents, a covered terrace anchored by a stone fireplace and a lakeside firepit — Sandy Creek Barn is an ideal venue for weddings, corporate functions and parties. While a rustic motif prevails, the facility comes with all the conveniences of a modern meeting venue: catering services, an antique saloon bar, a gourmet kitchen, and an outdoor grill and event porch. 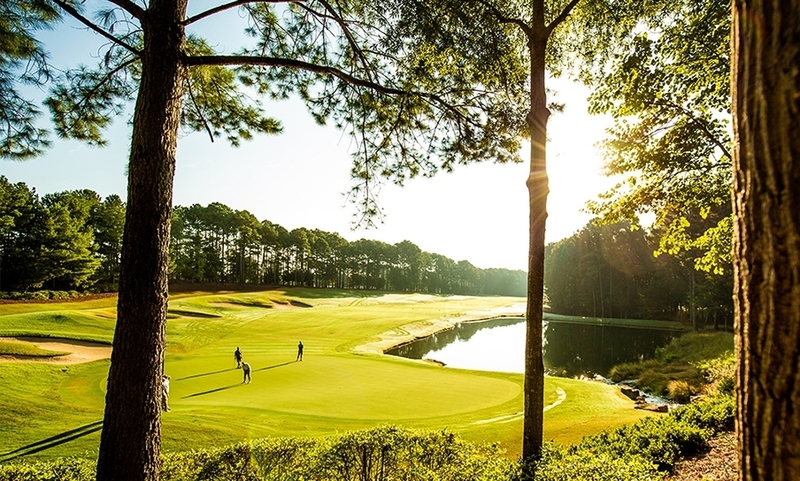 Offering panoramic views of Lake Oconee and the 18th hole of the Great Waters course, this stylish clubhouse is a perfect location for lakeside weddings, corporate parties or intimate gatherings. Warmly reminiscent of a grand antebellum estate with bay windows and a broad wraparound porch overlooking the lake, the Great Waters clubhouse has all of the elements needed to be the perfect venue for a special event. In addition to the interior spaces, there is a large lawn event space overlooking the lake that is suitable for outdoor celebrations. The clubhouse overlooks a large pond and fountain on the Plantation Course. A wraparound porch surrounds the main level just outside the main dining room and lounge. One flight down is the Piedmont Room, the perfect space for an intimate gathering which extends outside to a private patio. Adjacent to The Landing course and overlooking Lake Oconee, The Landing Clubhouse offers three elegant spaces, each distinctly unique. Submerged in natural light and wrapped by an extensive veranda, these intimate spaces are the perfect setting for meetings or dining experiences for groups from 10 to 80 guests. 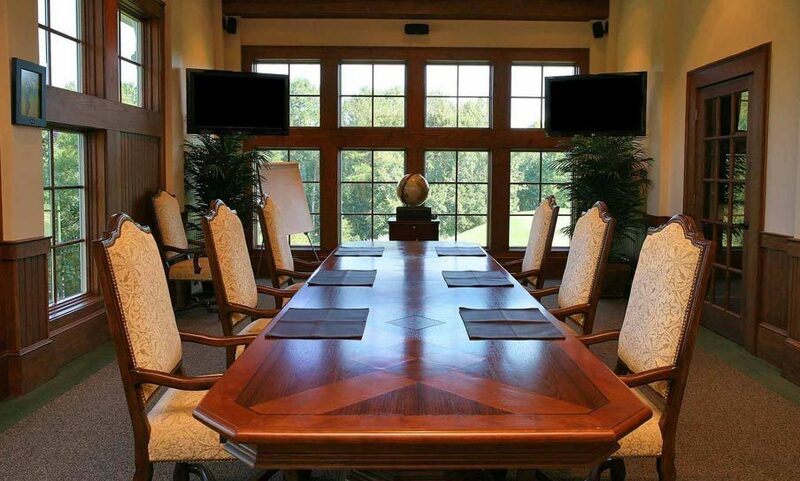 Within walking distance of The Landing Cottages, the clubhouse is also the ideal location for hosting your next meeting or event. Reynolds Kingdom of Golf presented by TaylorMade corporate programs are flexible and creative, providing groups of four to 144 with specialized golf outings. Each group will work with our on-site coordinators to customize their event to the specifications and needs of the company, providing a unique experience for clients and employees. Guests enjoy full access to an expansive practice range, four indoor hitting bays, a putting studio, an expansive outdoor short-game practice area for chipping and putting, and two enclosed full-swing studios, as well as dining and classroom facilities. Aptly named The Rock House, this rustic venue is a replica of the Reynolds family’s turn-of-the-century hunting lodge. With indoor and outdoor fireplaces, a large veranda overlooking the lake and stone walls with a high wood-beam ceiling, this intimate and cozy venue will leave a lasting impression on board meeting attendees and intimate wedding guests alike. The Spirit of Oconee offers an unparalleled on-the-water experience for your guests. 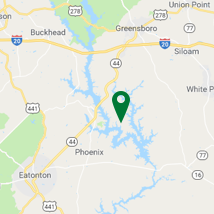 This 39-foot houseboat has a fully enclosed and climate-controlled lower deck with an open-air canopy on the top deck complete with an open bow area with plenty of seating to take in the 374 miles of shoreline as you cruise Lake Oconee.